Not purchasing groceries for a week always makes the week get increasingly challenging with each passing day. It also means that as the days pass each dinner becomes less and less remarkable. Of course that's not going to stop me from taking pictures and writing a blog entry! Not on your life, Jack! If anything it's going to make me more motivated to continue on with this fruitless endeavor. 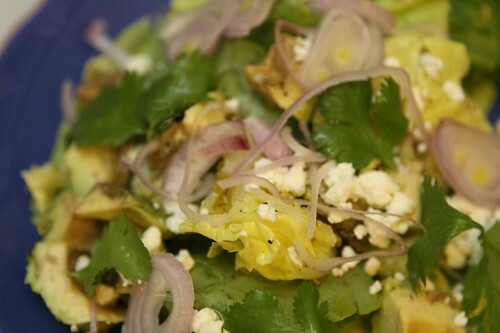 In keeping with my theme of mixing in whole leaf herbs in with salads I used the rest of the buttercrunch lettuce with cilantro leaves, feta, avocado, lime, and olive oil. 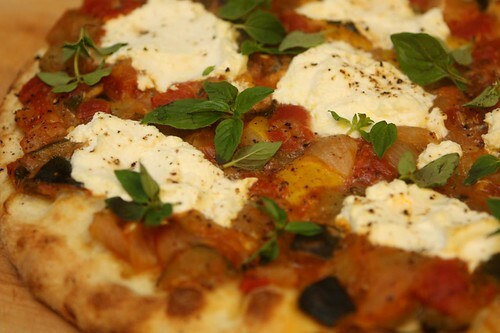 Tonight's pizza was made quite simply. I took last night's dinner leftovers, put them on top some pizza dough, and baked it in the oven. The only thing I added was some dollops of ricotta, fresh oregano leaves, and the last remaining shreds of a chunk of Parmigiano-Reggiano. This is just about the simplest form of dinner that is possible. It may be fortunate that there was no quinoa left. Not sure what that would have added to this pizza. 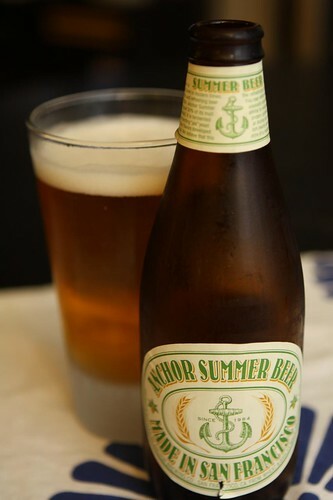 To accompany the pizza I selected one of the last beers in the fridge, this Anchor Summer Beer from Anchor Brewing. This beer was a little more bitter than I'd expected it to be but pretty good to go along with a shabby, leftover pizza dinner at 10:45 PM. Tomorrow's dinner is going to be a bit of a stretch. I have no idea yet what it's going to be but it might just involve a plate of romaine lettuce. Maybe I'll put some barbecue sauce on it. That will really give it some pizzazz!